Cities in Color is a 750-piece jigsaw puzzle series featuring some of the most amazing cities of the world colored in bright, bold hues. 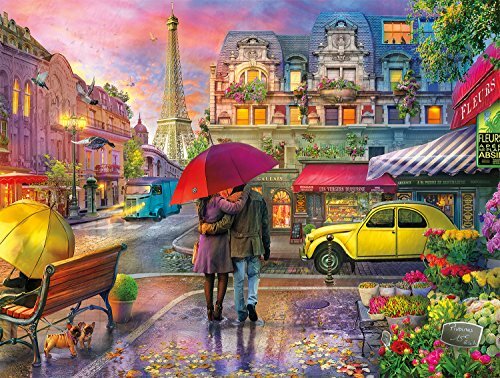 This puzzle, Raining in Paris, based on the Art of Lillia, is set near the world-famous Eiffel Tower. Under the pink sky of a summer’s night, bright-colored umbrella’s keep folks dry in town. Two dogs find shelter of their own under a bench as their owner rests on it and a couple walks by the flower shop where yellow, pink, red and purple flowers are for sale. This picturesque scene also captures the beautiful architecture of nearby buildings. Every Buffalo Games jigsaw puzzle is manufactured in the U.S.A. from recycled puzzle board. A precision cutting technique guarantees that every piece will fit soundly with the company's signature Perfect Snap™. A bonus puzzle poster is also included so that you have a handy reference of what the completed puzzle should look like while you put yours together.